I’m not sure if this is possible and I just haven’t found it, but is there a way to change the colours of the notes themselves? I’m aware that you can change the colour of a category but it would be great to see a function where you can change the colour of the notes too. Perhaps in the future but not something we expect to allow soon (except for the dark theme support). 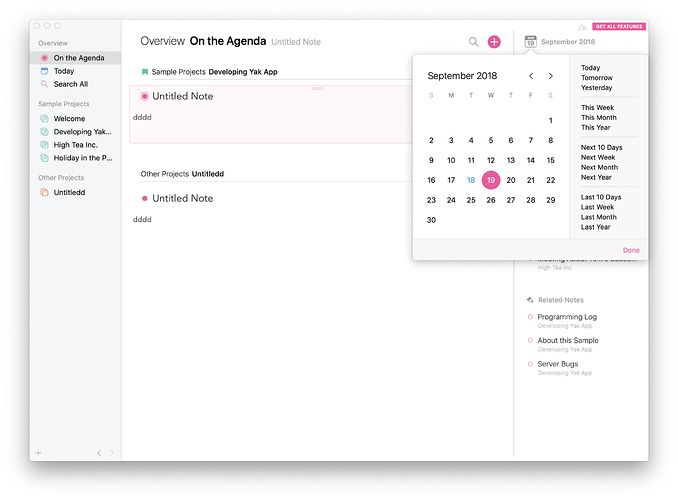 Agenda for Mac 2.4 now supports both the graphite theme on 10.13 and your preference for accent color on 10.14, the same goes soon for Agenda for iOS as well. This means that if you select a different accent color than the default blue, the buttons in Agenda will adapt this color as well. 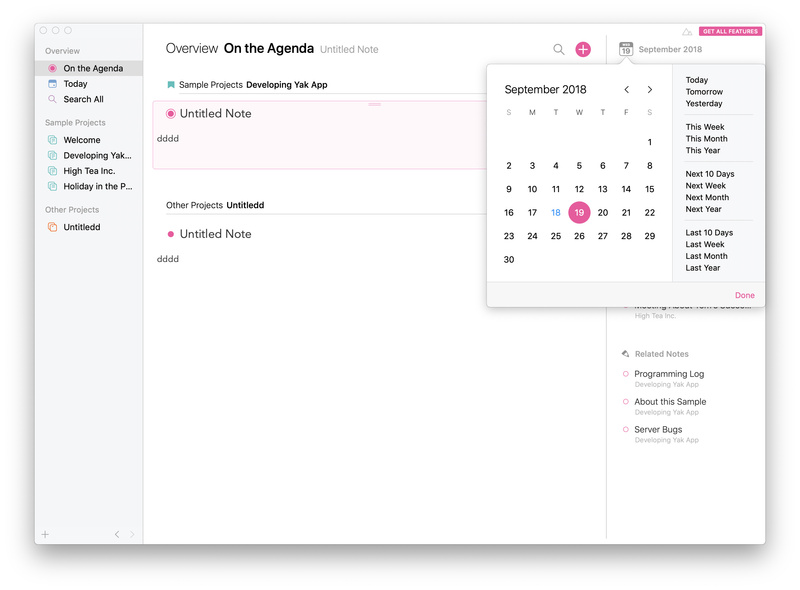 An example of Agenda for Mac when having the accent color set to pink in the System Preferences on 10.14 Mojave. Is this not yet an option for iPhone or iPad users? Not yet, we aim to add it in the next iOS update. We consider the blue accent color as the system default, and under these default conditions we stick with the original orange/yellow accent color. It unfortunately means we don’t allow for changing to a blue accent color. I’m afraid the extra complication of having a system independent color picker that trumps the system setting on mac is not worth it. I am afraid that this is an excellent example of a “hack” - giving the perception of choice by using the system color picker, but giving your own app a different color than the system that cannot be changed. This means that if anyone wants to change the default color of your app, they need to change it for their entire system. This is not user friendly design, nor does it mirror the iOS app. I hope you will reconsider adding a preference at least for using the system blue or the orange “hack” as the default color, but a proper selection would be more useful. I highly doubt most people know about the option to change the system color (and your app), and are stuck with this color on the Mac but not the iOS platform. Love the app, just not the color, and am not changing my whole system color just to fix the UI for one app. Please reconsider a proper execution of this preference. You’re absolutely right that you could consider this a hack, however we prefer the default color of the app to be orange not blue, that’s a design choice. Just like Apple choose blue as the default color for selection on macOS. 99 out of 100 people stick with blue because it’s the default not because they particularly prefer blue over any of the other choices, which is why we use our “default” color if you have the system set to the default highlight color. Unfortunately this comes at the cost of not being able to force Agenda to be using the blue color. Having said all this, we’ll try to add a hidden preference to override this choice in the next update. Thanks for understanding, and potentially including a work-around for this. Colors are funny things, and have lots of associated interpretations/feelings for people, so I think its great if you can include as many choices as possible (as you have for iOS). I was living with it until the color option changed on iOS, and now its jarring to go back and forth with the 2 platforms. Thanks for being so responsive about such a small detail. I have to say, I’m not enjoying this feature of Agenda reflecting my global accent color. There is a difference in meaning between those two. You choose your global accent color based on what is pleasing to your eye. But when it comes to content organization (notes, projects, tasks), every color suddenly becomes meaningful (green means this while blue means that). I’d like to be able to control my global accent color separately from Agenda’s accent color. Otherwise, it’s like choosing the color of your shirt or sofa based on your content color-coding system. Does not make sense. I’d also greatly appreciate it if, sooner rather than later, it’d be possible to change the colour of the notes themselves, independent of UI colour accent and independent of the colour of the other notes. Probably the best way to start is with a basic assortment and set at low opacity. Not the entire note; just its title. Where can I find this hidden preference to change the color to blue?